ИЗМЕНЕНИЕ ПЛОЩАДИ И МАССЫ ЛЕДНИКОВ В ДОЛИНЕ АЛА-АРЧА В КИРГИЗСКОМ ХРЕБТЕ НА СЕВЕРНОМ ТЯНЬ-ШАНЕ С 1964 Г - тема научной статьи по геофизике из журнала "Лед и снег"
Северном Тянь-Шане с 1964 г.
Статья принята к печати 8 сентября 2014 г.
ASTER, Corona, Digital Terrain Model (DTM), Geodetic Mass Balance, Glacier Change, Rapid Eye, Tien Shan. Геодезический баланс массы, изменения ледников, спутник Corona, Тянь-Шань, цифровая модель поверхности (DTM), ASTER. Glaciers are an important source of fresh water for Central Asia as they release water during the summer months when precipitation is low and water demand highest. Many studies address glacier area changes but only changes in glacier mass can be directly linked to climate and runoff. Despite the importance, investigations of glacier mass changes have been restricted to only a few glaciers in the Tien Shan until now. Geodetic mass balance measurements are suitable to complement and extend existing in-situ measurements. In this study, both area and mass changes of the ~40 km2 glacier ice in the Ala Archa Valley, Kyrgyz Tien Shan, were investigated using 1964 and 1971 stereo Corona, 2012 stereo ASTER, the SRTM digital terrain model and other optical data such as Landsat ETM+ or Rapid Eye. In addition, ice thickness was modeled taking the basal shear stress and the glacier surface topography into account. The results indicate an area loss of 18.3±5.0% from 1964 until 2010 with continuous shrinkage in all investigated periods. The glacier's mass balance was -0.45±0.27 m w.e. a-1 for the period 1964-1999 and -0.42±0.66 m w.e. a-1 for 1999-2012. Golubin Glacier showed a possible slight mass gain for 19641971 and a decelerated mass loss for the 1999-2012 period. This is in good agreement with existing in-situ measurements exiting from 1962 until 1994 and since 2010. The overall ice volume was estimated to be 1.56±0.47 km3 of ice in the year 2000. Hence, the entire ice would be lost by 2100 if the mass loss would continue at the same rate. Дана оценка изменения площади и массы ледников в долине Ала-Арча в Киргизском Тянь-Шане с помощью стереоснимков спутника Corona 1964 и 1971 гг., стереоснимков ASTER 2012 г., цифровой модели земной поверхности SRTM и других оптических данных. С 1964 по 2010 г. ледники непрерывно сокращались и потеряли 18,3±5,0% общей площади. Масса ледника Голубина в 1964-1971 гг. незначительно росла; в 1999-2012 гг. его сокращение замедлилось. Shan show first an increase of runoff with temperature increase followed by a reduction with the continued glacier shrinkage even with continuous temperature rise . It is therefore of high importance to study the ice storage of the glaciers and their past and possible future evolution. The temperature increased on average since the 1950s accompanied by a slight but not significant increase in precipitation in most parts of the Tien Shan [2, 6, 11]. Concomitantly, glaciers of the Tien Shan shrank like in many other parts of the world since the little ice age  with a pronounced recession in the last decades [2, 3, 7, 11, 20, 31]. The detected area loss since the 1950s is higher in the more humid areas in northern Tien Shan than in the more arid regions of the central and eastern Tien Shan [34, 47]. Declassified imagery from the 1960s and 1970s were found to be suitable to extend the analysis back in time and to evaluate glacier outlines based on topographic maps [10, 14, 35, 36]. Area changes show an indirect signal to climate while the glacier mass balance can more directly be related to climate and hydrology. 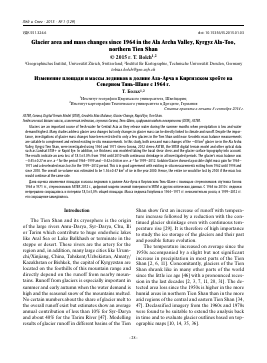 Existing mass balance measurements in the Tien Shan indicate a pronounced mass loss since the mid- 1970s which is highest at Tuyuksu Glacier situated in Ile Alatau (also: Zailijskij Alatau) at the northern margin of the Tien Shan [17, 50]. However, mass balance measurements exist just for a few glaciers and only Tuyuksu Glacier and Urumchi Glacier No. 1 in eastern Tien Shan were measured continuously. Several other measurements, such as at Abramov Glacier (Pamir Alay, southern Kyrgyzstan) and Karabatkak Glacier (Terskey Alatau) were interrupted since the collapse of the Soviet Union. Between 1968 and 1994 in-situ measurements were also performed at Golubin Glacier in Ala Archa Valley/ Kyrgyz Alatau [1, 50]. The mass balance was found to be predominantly negative. Mass balance measurements at Golubin Glacier were re-established in 2010 and showed a slightly positive value for 2010/2011 . However, no mass balance information exists between 1994 and 2010. Geodetic mass balance estimations are suitable to evaluate, complement and extend existing in-situ measurements [15, 51]. National digital elevation models (DEMs), the near global SRTM3 DEM, as well as DEMs derived from optical stereo data such as SPOT, ASTER or Corona were found to be suitable for this task [9, 15, 41]. However, careful co-registration and an estimation of the penetration of the SRTM C-band radar beam into snow and ice are required to reduce uncertainties [12, 24, 37, 42]. A prerequisite for hydrologic and glaciological modelling purposes is not only the knowledge about the change in volume but also about the glacier volume and its distribution over the glaciers. The glacier thickness can be measured in the field e.g. using ground penetrating radar (GPR). This is, however, only feasible for a small numbers of glaciers. Simple models are required to estimate the current and future glaciers volume for a large number of glaciers simultaneously. Promising approaches to model the glacier bed topography based on the surface topography, glacier outlines and possibly additional information about glacier mass turnover and the mass balance gradient [22, 33]. for different periods between 1964 and 2012 using remote-sensing derived information. The KyrgyzAla-Too (Kyrgyz Range) represents the north-western part of Tien Shan with an east-west extent of over 400 km . The water released at the northern slope drains into the river Chu which is the main artery for the (semi-) arid lowlands in Kyrgyzstan and Kazakhstan including Bishkek, the capital of Kyrgyzstan. At its northern slope, 40 km south of Bishkek, the study area of this work can be found: the Ala Archa National Park (74°24' E - 74°34' E; 42°24' N — 42°36' N, Fig. 1). This nature reserve was established in 1976 and constitutes a total area of 194 km2 and extends along the Ala-Archa river basin and the surrounding with altitudes ranging from 1,500 m at its entrance up to 4,895 m at Semeno-va-Tyan-Shanskogo Peak. Glaciers cover an area of ~33.3 km2 and extend over an altitude range of 3,310—4,760 m (2010). The annual precipitation increases from less than 400 mm, measured at Bishkek station at an elevation of 771 m asl., to about 700 mm at the glaciers . The maximum precipitation occurs in late spring to early summer (see Fig. 1). Рис. 1. Карта района исследований , климатическая диаграмма г. Бишкек. УСУБАЛИЕВ Р.А. — 2006 г.
АБЫЛМЕЙИЗОВА Б.У., БАКИРОВ К.Б., ДИКИХ А.Н., МОЛДОШЕВ К.О., УСУБАЛИЕВ Р.А. — 2007 г.
ДУДАШВИЛИ А.С., УСУБАЛИЕВ Р.А., ЭЛЕМАНОВ О.И. — 2012 г.
КУЗЬМИЧЕНОК В.А., КУНАХОВИЧ М.Г., КУТУЗОВ С.С., МИХАЛЕНКО В.Н., НАГОРНОВ О.В., СОЛОМИНА О.Н., ШВЕЙНГРУБЕР Ф., ЮРИНА Ю.О. — 2006 г.